Paul Schullery might well be described as ‘the thinking fisherman’s fisherman’ and has written more books than I would care to name on an absolutely breathtaking range of subject matter. If we only consider his books on trout, they range from a novella about a man who finds the perfect fly, to the heavily illustrated ‘The Rise’, a ground-breaking work which every fly fisherman should own, for the amazing insights it offers into how trout see. 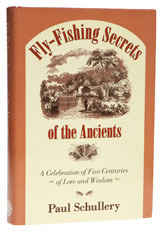 Fly Fishing Secrets of the Ancients harks back to the author’s long standing interest in history. The theme is simple, though the lessons are deep - there are many lessons to be learned from how our ancestors tried to solve the problems we face today. One of the messages is that sometimes they succeeded, but the lessons they put so much effort into learning have sometimes been forgotten, with the result that much time is being lost reinventing wheels. Another message is that some of the ‘progress’ we have made isn’t quite so clever as we imagine, and though we look back at materials like gut and wonder how our fathers and grandfathers managed to fish with it, in reality, it had its virtues. Gut knotted well and was forgiving in a way that some modern nylons are not - so who is kidding who about progress? A thought-provoking book and one that would make a wonderful present to the fly fisher in your life. Who knows, it might stop him spending even more money on new tackle he doesn’t need?